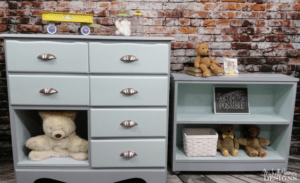 Well it seems like it has been a few months since the last Fab Furniture Flippin’ Contest but I am back today with my January entry. 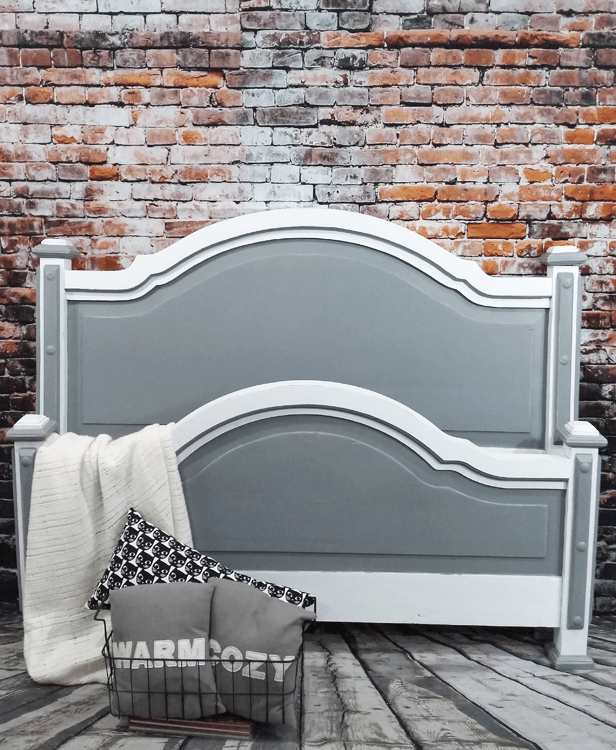 You will love how this pretty headboard and foot board were transformed using two paint colors and my HomeRight paint sprayer. This months theme is “Spray it Pretty” and our sponsor is the wonderful HomeRight. 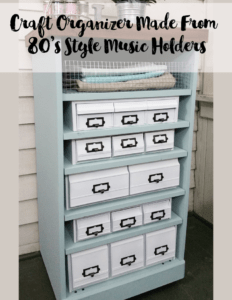 They are a great company for DIY lovers and they feature a lot of projects on their blog. They also carry spray tents (which I want pretty badly), heat guns, paint sticks and more. 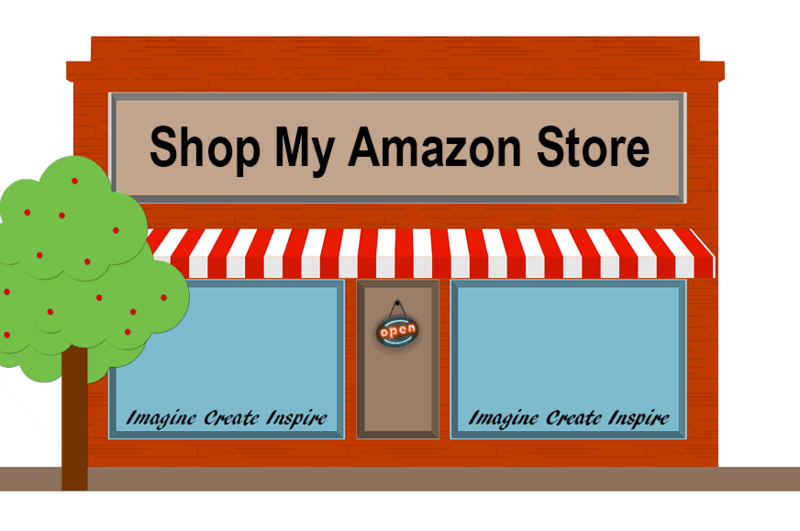 Be sure to check out their site after you get done here! 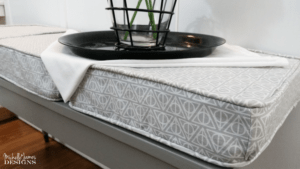 Some or all of the hosts of The Fab Furniture Flippin’ Contest receive monetary and/or product compensation from the sponsoring brand, HomeRight, in order to complete their themed projects. HomeRight will also provide the prize package for the contest winner. We were given a HomeRight Sprayer to get the job done. Now you all know that I love this sprayer so all of the opinions are 100% my own. This is how these guys started out. They were wood with a light stain on them. I wanted to be sure the stain wouldn’t bleed through and even though I was using a gray paint I am still a little scared of bleed through. It just saves a lot of time to primer everything at the start. So that is what I did. 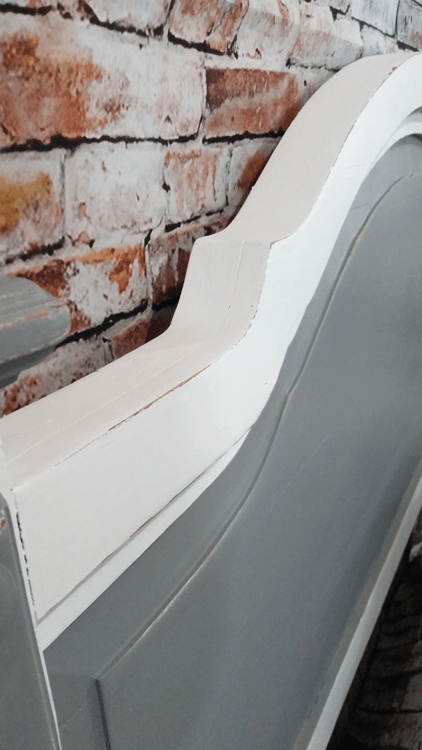 I don’t have pics of this step because you all know what white primer looks like. Am I right? I was making over for a friend so she chose the colors and I love them. She choose a gray and a white combination. 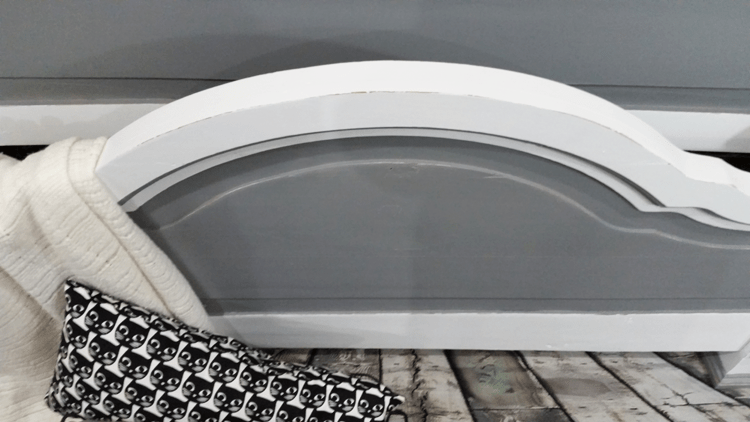 I purchased latex paint for this project. I have found that latex works the very best in the sprayer. And when the sprayer works well, then all is right with the world. And, of course I was right. It went on like a dream. 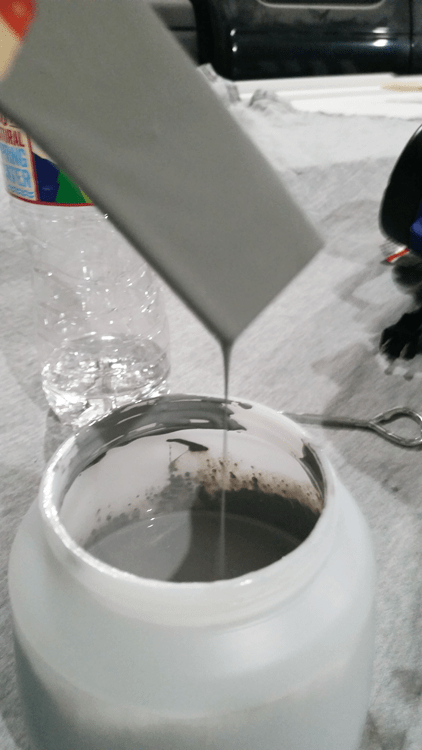 But before we get to that spraying part we need to talk about how to prep the paint for the sprayer. All it takes is a thinning of the paint with water. It needs to be pretty thin. In fact almost as thin as the water. This is what it was like dripping from the stir stick. This was a pretty large project. 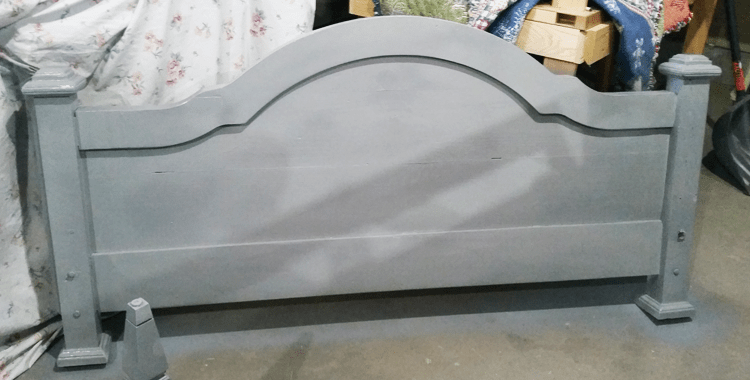 I needed to paint the front and backs of the headboard and foot board and I was spraying a little end table at the same time. You will see that at the beginning of February. So I mixed a good amount into the sprayer bucket. 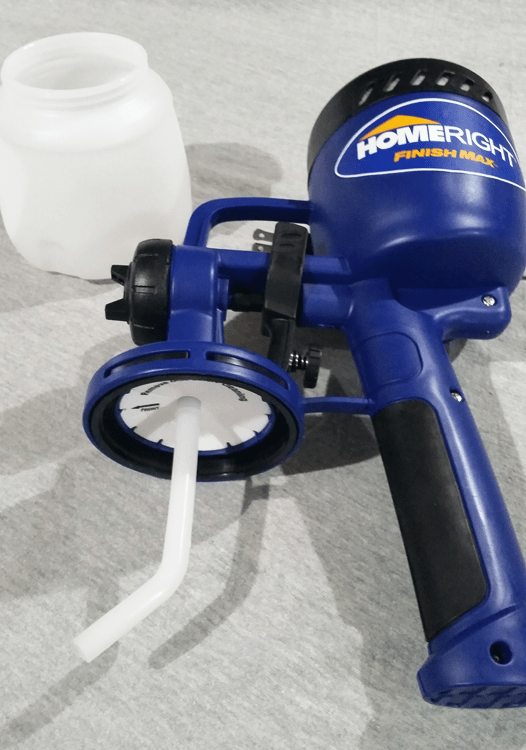 This Finishmax Sprayer is incredibly easy to set up and cleaning isn’t any worse than cleaning your brushes. I hate it but I do a good job to keep it working perfectly each time I use it. Basically it looks like this before you add the paint bucket. You can turn the little tube to have the bend facing the front or the back depending on how you will be holding the sprayer. I use mine facing the front 99% of the time because I am usually holding it facing down. It allows you to adjust the type of spray as well. This time I wanted a vertical spray since I was covering a large area and making side to side movements. You can also choose a horizontal spray or sort of a cone shape that is really nice for table or chair legs. I usually switch it around during the painting depending on what part of the furniture I am working on. You really get the feel for it as you go. Here is what the foot board looked like after the gray was added. I think it already looks better! I used two sizes of brushes for the white paint going right over the gray. I did not do any masking for fear the tape may lift up some of the gray paint that looked so good. This happened to me for the first time not long ago and it was a nightmare. Luckily that project was my own. A larger brush (well about 1-1/2 inches) did the larger, wider areas and I used a small brush for the fine areas around the trim on the legs and the small detail near the top. It took a couple of coats and some touch up of white and gray but I got it done and it really turned out nice. The gray and white make a great color combo and the accents really stand out. What do you think? I love it and I am pretty sure my friend will too. 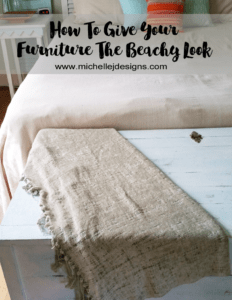 If you are a blogger/DIYer and are interested in participating in this amazing contest you can email info@fabfurnitureflippincontest.com for more information. 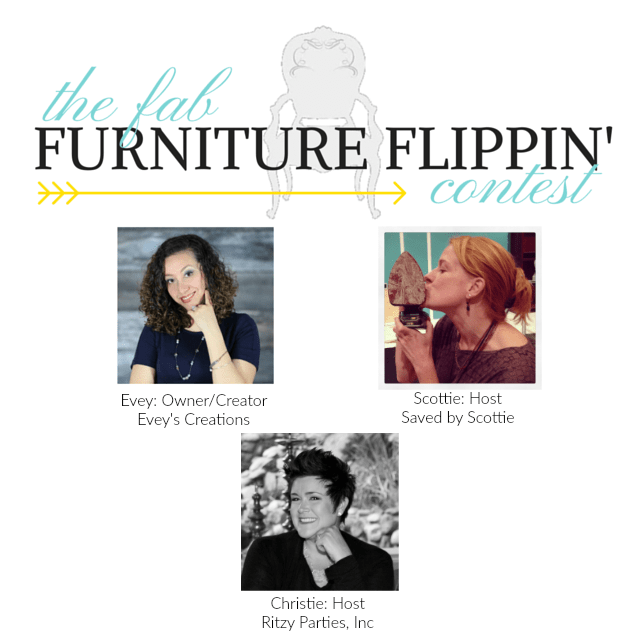 Be sure to visit Fabfurnitureflippincontest.com to see all of the entries for this months contest. 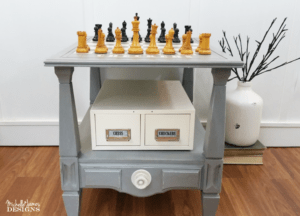 There are some very talented furniture DIYer’s out there. Thanks so much for stopping by and wish me luck in this contest! LOL! Love it Michelle. The colors are so beautiful. I love my HomeRIght sprayer too! Thank You Carolann! The sprayers are so nice to have. I love them for large projects like this one and for spindle filled chairs n stuff! Thanks for stopping by! Heck yeah! This looks fabulous! Thanks Peggy! I think Jody will like it! 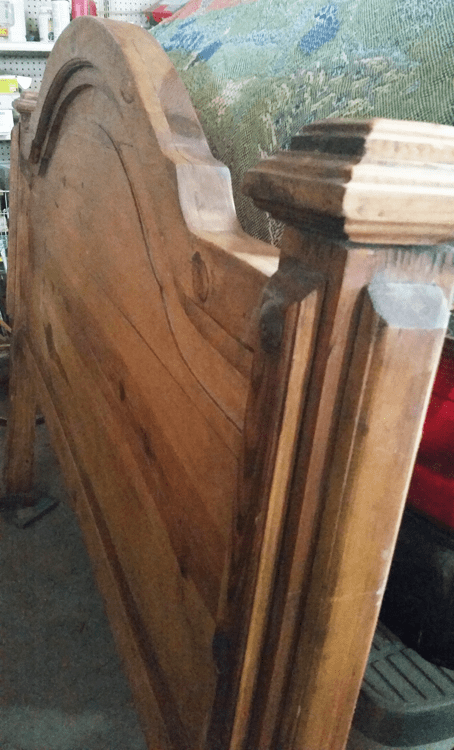 What I think is that you did an amazing job on this headboard. The gray and white look so refreshing. Hubby would love a paint sprayer like that for a big job. 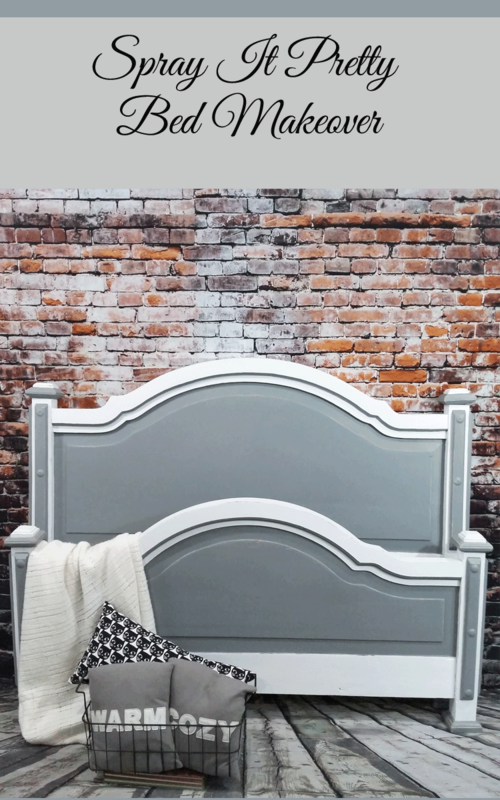 This headboard looks like it is for sale on Wayfair. Wow Sue, Wayfair! That just made my day. Thank you. 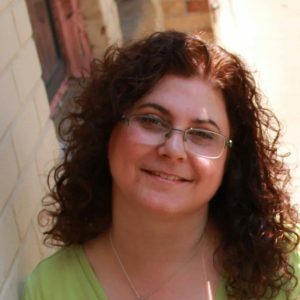 Michelle, what a great project! Love the contrast of these colors…super simple yet chic! Nice job! and that brick wall….wow! Stunning bedroom set. I love your color choices simply stunning. Great job Michelle. Thank you Anj! I love the way it turned out. She picked it up and today and was thrilled! 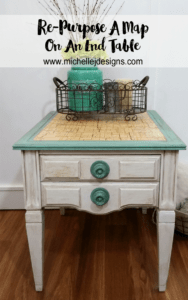 Wow Michelle that is so beautiful now, I love the colors you chose and the two tone with the white is really fresh and lovely! Hi Toni! Thanks so much. My friend knew exactly what she wanted and she was right. The colors were spot on! Thanks so much for the comment. I love a good before and after, and this is an awesome one!! Thank you Brittany. It did turn out pretty nice and she was thrilled. It is actually going to her daughter and I think she loved it too. What an amazing update! 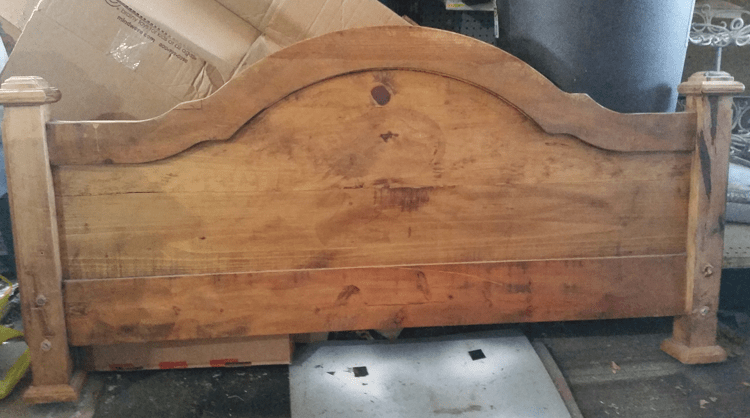 No one would have ever guessed it started out as a heavy looking wooden headboard! Hi Leanne. Yes it was very heavy looking. That is the perfect description. I was so happy with the results and so was she! It was a win win.